The first thing that came to mind when we toured the inside of the factory and the chalet, is that Steve Reddy needed to be here today. The chalet was built by the owner Julius Boehm and he lived in the apartment over the candy store. The room I chose to sketch was the Music Room (or his living room). I was attracted by the green ceramic stove in the corner, but proceeded to move across the space trying to describe all the interesting art, furniture and artifacts of the room in my sketch. I also wanted to get out and about Issaquah to sketch some of the older buildings that give it so much character, so after we finished at Boehms, I headed to a couple of other locations before heading home. 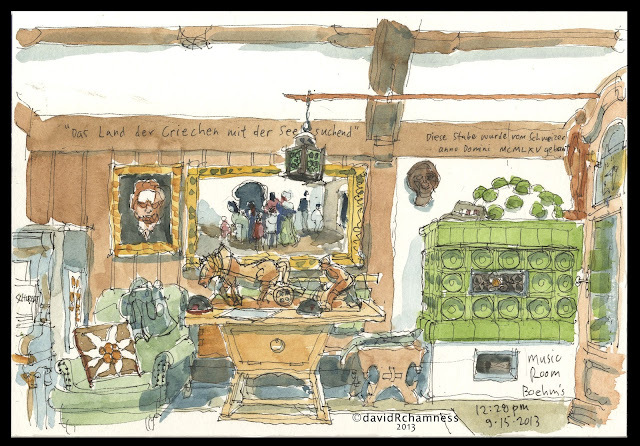 please go to the flickr site for my other sketches form Issaquah. David, this is an amazing sketch!! You completely captured the essence of this place in this sketch with the detail, color and composition. Really really great.